Yonder is set on the massive island of Gemea, a lush frontier with eight distinct environments ranging from sunny tropical beaches to frigid snowcapped summits. Each location has its own flora and fauna, along with changing seasons and a day-night cycle. Gemea, once a paradise, still maintains the appearance of one, yet an evil murk has enshrouded the land and its people in despair. The hero of Yonder will explore the island, uncovering its secrets and the mysteries within them self as they embarks on a journey of self-discovery, while saving Gemea and its people. On the quest to become the island’s champion, he or she will join forces with natives and Sprites, ethereal creatures whom are the only thing capable of dispersing the murk. The towns of Gemea are filled with kind-hearted residents who have faced many difficulties since the arrival of the murk. By contributing to the island through talents like farming, crafting, cooking, fishing and brewing, relationships can be built with the locals, who offer everything from resources to a new farm as rewards. 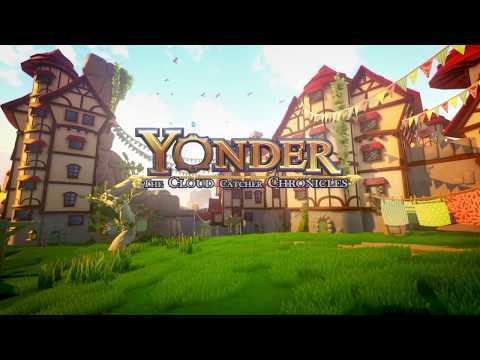 Yonder: The Cloud Catcher Chronicles was released on Switch 342d ago in the UK. Based on 7 Yonder: The Cloud Catcher Chronicles Switch reviews, Yonder: The Cloud Catcher Chronicles gets an average Switch review score of 72. The score for all versions is 70 based on a total of 16 reviews. This is a game which taught me to love the feeling of being lost, and I’m sure it’s one I will return to for a long time. While it certainly won’t be everyone’s cup of tea, those looking for a laidback trip through a stunning world, look no further. For those just wanting to spend some time chilling out and exploring in a great-looking world, Yonder: The Cloud Catcher Chronicles is certainly one to recommend. If you want to do some peaceful meandering during your commute, the Switch version is easy to recommend. I still found Yonder to be a peaceful delight despite its shortcomings. While it has shallow gameplay systems and minimal story, Yonder is a pleasant place to unwind and pass the time.